We are remarkable entity, engaged in manufacturing and supplying an excellent array of Water Dispenser. Our entire range is manufactured by using optimum quality plastic and the latest technology in compliance with international standards. This dispenser is beautifully designed and manufactured by our skilled and trained professionals. Clients can avail this range from us at reasonable prices. Furthermore, our dispenser is available in different design, sizes and colors as per the requirements of our clients. Located at Pune, (Maharashtra, India), We “Suyog Industries” has emerged as the reputed Manufacturer and Supplier of high quality plastic and pet products. 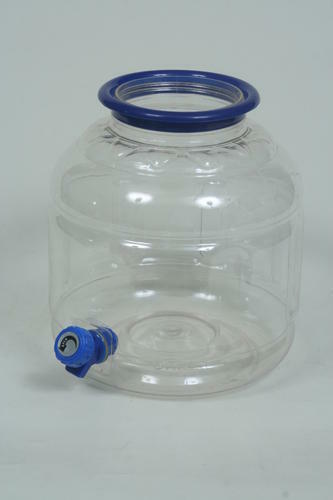 Since our inception in 2009, we have been able to provide world class plastic & Pet products including Water Dispenser & Cool Jar, Pet Bottle, Plastic Cap , Pet Jar and Water Jar. Our products are precisely manufactured using high grade plastic and contemporary technology at our ultramodern manufacturing unit. Our products find wide application in house, hotels, restaurants and houses for storing water and other liquid products. Our offered products are widely appreciated and acclaimed in the market for some of their striking features like flawless finish, scratch resistance, unique modular design, clear transparent, and high storage capacity suitable for BIS. Further, in order to design and manufacture products as per the detailed specified by our customers, our professionals used innovative techniques and latest machines while designing. An asset to our production line, our ultramodern production unit is completely equipped with all the contemporary machines & tools. We have all the resources ready at our manufacturing unit to update the quality of product as per the specifications laid by our customers. Furthermore, our team of highly adapt and seasoned professionals manage all the departments properly for assuring accurate, fast and smooth business functioning. Owing to the industrial expertise of our team, we are able to offer a range of products that is able to live up to the expectations of the customers. Moreover, we are backed by an in-house testing unit where our entire range of product is tested under the supervision of highly skilled and experienced professionals. We ensure that all our products are in compliance with the international quality standards. Leveraging on our quality standards, we have been able to gain the optimum satisfaction of our clients. As a quality-centric firm, we put endless effort for bringing high quality standards in our product range and for this, we test our entire assortment against numerous quality parameters. We make sure that our each and every consignment is accomplished within the stipulated time period. Before the consignments get dispatched, we test each and every product against various stringent parameters to make sure that our clients get flawless stock. Further, for the convenient of our customers, we have kept easy payment modes in terms of cash and cheque.